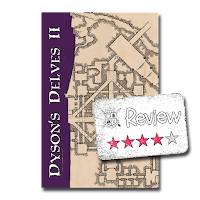 Last month I recommended Dyson's Delves II when it was the Deal of the Day over at DriveThruRPG. Of course I had to put my money where my mouth is and pick up a copy for myself. 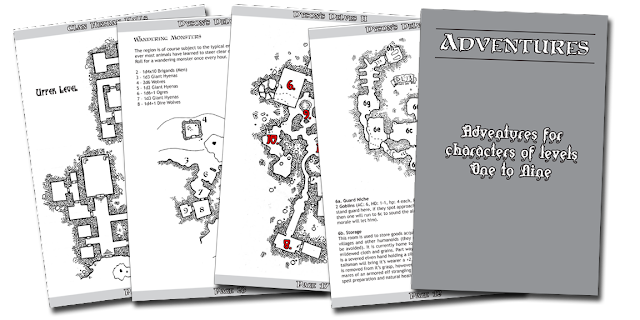 Overall I was quite pleased with the purchase and I'm busy trying to tweak the PDF a bit into a more desirable print format so I can keep it in my gaming bag as part of my "go-to" gaming kit. I can do this because Dyson didn't put any security on the PDF. This product was clearly designed for a print run because the back cover/page is marked "first edition" and the intro mentions "As the owner of this book, you have permission to photocopy any maps herein for your personal use". My major sources of disappointment stem from this simple fact because I think it wouldn't have taken too much work to tweak things for a more optimal PDF format and/or presentation. 1) I have to start off with the cover. 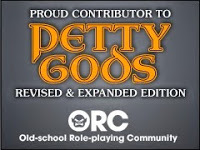 After looking at the product;s DriveThruRPG page, as well as Dyson's G+ posts promoting it and his website, I fully expected the cover to be the cool graphic show above. Instead it is actually a rather boring gray number. Even if it was the graphic I used as a lead-in, that graphic is a bit sloppy. Note the bit of tan poking through the purple field between & under the "D" and 1st "s" in Dyson's name. 3) Super minor and probably just me, but I wish that the PDF didn't use so much grey on each page and those section pages. Since I'd like to print this up all that is just wasted ink. One thing for a professionally printed product, but for a PDF possibly printed at home.....just a waste. 4) Now this is my biggest pet-peeve, but a mark of professionalism in my opinion, please....PLEASE, add fricken bookmarks and renumber the PDF pages so things match up to the Table of Contents! With 154 pages of content and a TOC, there is no excuse for not bookmarking a $10 PDF product. If you (as in reader of this post) need help with renumbering PDF pages, my buddy Mark Plemmons put up a great how-to guide on how to do the page numbers right. TL;DR In the end what I have is a nice-enough PDF of content. I like the various adventures and love the maps in Dyson's Delves II, but the formatting leaves a lot to be desired. 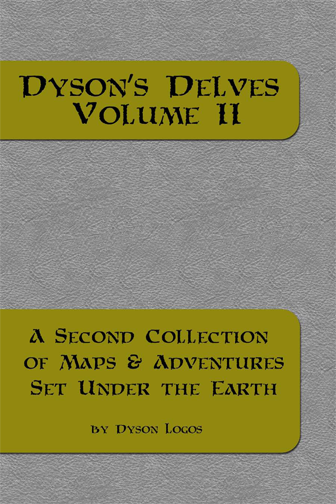 The majority of the content is available for free or from his other products and the added-value for Dyson's Delves II should be the format and having all this in one place. Since the PDF isn't secured at least I can tinker with the problematic elements before I print this booklet up.